An artist's illustration of the European Space Agency's Philae lander touching down on the Comet 67P/Churyumov-Gerasimenko in November 2014. After more than two weeks of silence, the European Philae lander on the surface of a comet phoned home once again this month in a long-distance call routed through its Rosetta mothership. The Philae lander was in hibernation for months after its rocky landing on Comet 67P/Churyumov-Gerasimenkolast November, which saw the probe drift off course for two hours before landing in a shadier spot than its solar panels were designed to handle. It was carried to the comet by the European Space Agency's Rosetta spacecraft, which has been orbiting 67P since August 2014. For unknown reasons, Philae initially ignored a wake-up command for one of its instruments on July 5 when Rosetta should have been in a good spot to transmit the instructions. This led to a "mixed" mood at the German space agency's (DLR) Lander Control Center. However, a transmission last Thursday (July 9) confirmed Philae was working. The spacecraft successfully submitted data from its COmet Nucleus Sounding Experiment by Radiowave Transmission (CONSERT) instrument, which is being analyzed. "This sign of life from Philae proves to us that at least one of the lander's communication units remains operational and receives our commands," Koen Geurts, a member of the lander control team at DLR Cologne, said in a statement. 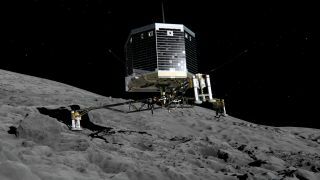 "We never gave up on Philae and remained optimistic." The lander is now ready for more work at its perch some 300 million kilometers (186 million miles) from Earth as the comet makes its closest approach to the sun this month. Rosetta and Philae are funded through at least 2016 to see how the comet changes with the sun's warmth. While Philae was in hibernation, Rosetta regularly sent back images from the comet. Additionally, several science papers have been published on the mission's findings. For example, the mission has found evidence of ice and organics at the surface, and has tracked changes as the comet's surface warms up.